This recipe is a lie, so I must apologise, its not actually a recipe at all, just an idea. Pancakes are a staple food in our kids lunch boxes, both kids ALWAYS finish their lunch when I send them. But heres the thing, I don’t make them, I cheat and I use a mix. I figure I make at least 95% of our food from scratch so a bit of cheating every now and then is a treat. I either use Basco Pancake mix from Spinneys, or Freedom Pancake mix from Gluten Free supermarket. If you don’t want to cheat, you can use Orgran self raising flour or Melindas self raising flour (both have the recipe on the bag). The good thing about Basco or Freedom Pancakes is that you just fry the ones you need, the rest of the mix keeps in its jug in the fridge for a few days. If you want, you can even fry them the night before and keep them in the fridge, usually if I do this I just pretend its bread and pop butter and cheese on them. If fried on the day I serve them as above and send fruit or berries to go along. Pingback: Lunch box staples | GlutenFree & Me…. and Poland! 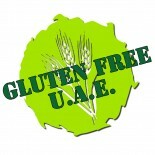 This entry was posted on 20/11/2012 by glutenfreeuae in Lunch Boxes, Recipes and tagged glutenfree, kids, lunch box, pancakes, school lunch, vegetarian.